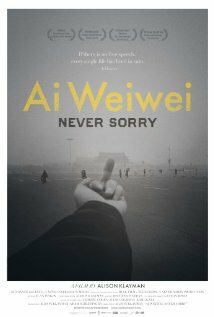 Film Review: Ai Weiwei's "Never Sorry"
Last night I sat down and watched the critically acclaimed film "Ai Weiwei Never Sorry" by Alison Klayman. The film is available on Netflix for instant streaming and is worth every minute. Although this film isn't really all that new, I just recently found the time to sit down and watch it. Not only are the visuals stunning but following the journey of one of the most infamous artists in recent history is something I will never forget. As the movie progresses we learn a little bit about the artist's controversial past. Following the Earthquake of 2008, Ai Weiwei made it his own mission to document the deaths of children in poorly government built schools. A mission which should have been the responsibility of the government but was instead hidden from the public. He and his volunteers traveled village to village interviewing teachers and parents to get the names and birth dates of the children lost in the horrific disaster. Ai went on to install 9,000 backpacks on a wall outside of his show, So Sorry at Haus der Kunst in memory of the lives lost in the earthquake. During this exhibition he was hospitalized with brain hemorrhaging due to police brutality months prior. The film really follows the story of the police brutality and the events following, including his eventual arrest. The really fascinating part is the way he acts as a voice for the Chinese people. During his non-violent protests and exhibitions he is always accompanied by everyday fellow citizens united under his cause. The courage comes out from the people that would normally be too terrified of the repercussions of lashing out at their oppressive government. Throughout the film, Ai speaks on the importance of Social Media and the Internet, especially Twitter. He is nearing 200,000 followers and posts every few hours generally. You can follow him and use the built in google translator, although sometimes it isn't easy to follow. I recommend everyone to give this film a watch, whether you are an artist or not. You may not follow his beliefs but it is hard not to become motivated watching this film. It is incredible to listen to someone speak who is so passionate about their causes and work. It honestly brought tears to my eyes quiet a few times.